In the renewable energy CSOP (RE-CSOP), consumers participate in an RE project through an intermediary company – the CSOP-LLC. They are represented on the board of directors by a trustee consulting them, moderating the decision-making process amongst them and safeguarding their interests. Realising a consumer investment in a renewable energy installation can be initiated by a group of private energy consumers together with their municipality and/or local small or medium-sized enterprises. It comprises the following steps. Completion of standard energy supply agreements between consumers and the CSOP-Ltd. 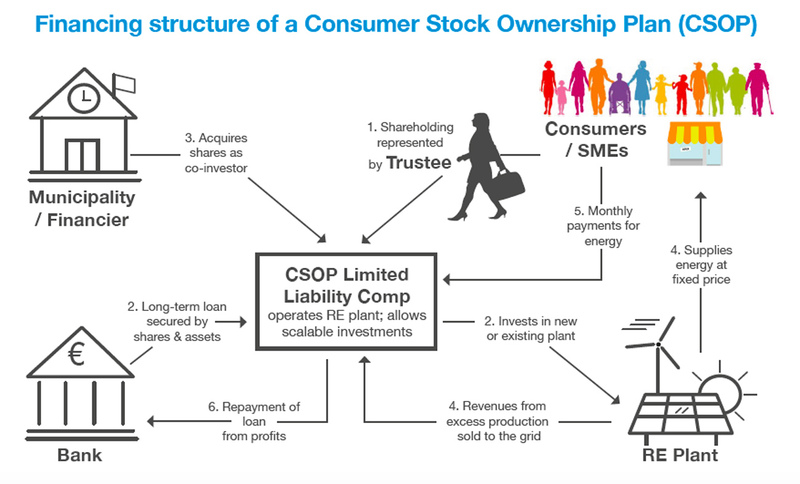 The CSOP-Ltd. then takes on a bank loan on behalf of the consumer-shareholders and provides collateral to secure the loan (value of the plant plus contributions), thus shielding the consumers from personal liability. The RE-installation supplies the consumer-shareholders with energy and sells surplus production; all revenues flow into the CSOP-Ltd. Repayment of loan: interest and principal are serviced with revenues from the sale of the surplus energy production from the power plant and from the monthly payments for energy by each household. After the repayment of the capital acquisition loan, profits from the power plant are payed out to the consumer-shareholders as dividends in proportion to the amount of their shares. The ground-breaking aspect of an RE-CSOP is the fact that the consumer-shareholders are provided with a second source of income from capital ownership without having to be wealthy. Their financial participation does not require any savings. Instead, it is enabled by future profits from the investment, i.e. revenues from energy sales. For more legal, financial and technical information about the financing structure and phasing of a CSOP, please do not hesitate to contact us.